Today is Friday and it is the farewell party at the Abby Underground in Denton. So Dominica and I are planning on going up there with Rachel this evening to see the concert. Technically the Underground is going to be open next week, as well, but next Friday’s concert is not of the “local” bands that everyone knows, so tonight is the home town crowd’s last hurrah to the club. Like most days this week, today was busy and hectic. A very exhausting day. I was looking forward to escaping this evening, for sure. 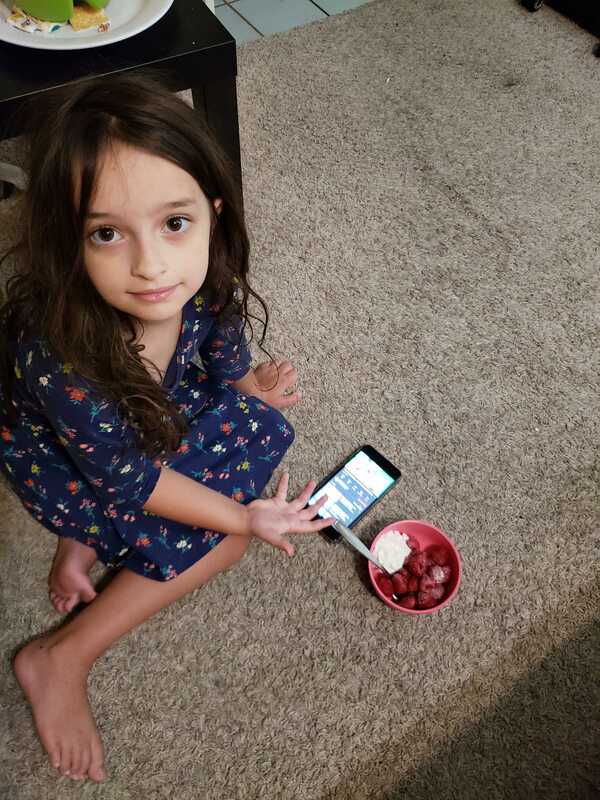 Luciana has discovered that she loves berries with sugar and whipped cream. She had me make her raspberries tonight. Rachel ended up driving to our house this evening so that we could all drive up together. We drove up to Denton at eight and picked up William before heading to the Abby. Parking was a nightmare. We had to drive all over downtown trying to find any available parking spots. It was a mess. A popular night for going out in Denton. We got there at eight thirty, luckily getting there while Grrg’s band, also called Grrg, was still playing. So we got to see the last half of their set. Loads of people came out tonight. We had a good time. Some really good bands towards the end of the night. We knew lots of people there and made some new friends, too. Shaolin Death Squad did a great job. Jaiden’s band was the last one up for the night. They did an awesome job and the crowd really enjoyed it. It’s the first time that we have seen his band. After the concert and closing down the Abby Underground, it was back to the house for some sleep. We had to take a few people home and grab Taco Bell on the way back, so it was closer to four when we got back.